It was a phrase we were to hear repeatedly over the next three days, along with “lovely jubbly”, “easy peasy lemon squeezy” and “owight maaay” (think cockney impersonations). It appeared we weren’t the first tourists here. In fact, one of our guides, Bobby, had been doing this for 15 years. 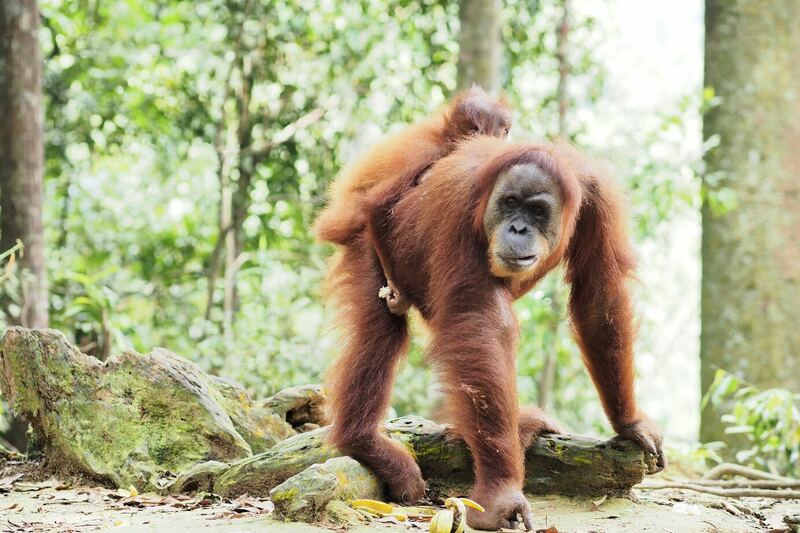 My first encounter with an orangutan was not in the wild, but rather in a zoo in Spain. I can’t remember how old I was, but my elder sister was being passed off as under 12 by my mother, who only wanted to pay a child ticket for her. My mother, the serial age deceiver: honest to the core…except when it comes to child fares. It must be why I always think I’m younger than I actually am. 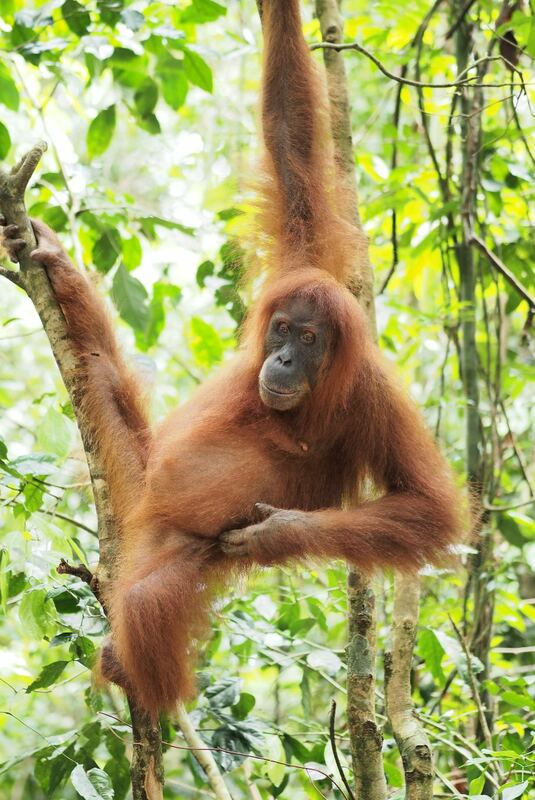 Anyway, back to the orangutans. Holed up in a large (but not nearly large enough) wire cage, a small baby had poked its head between the bars and got it lodged there. The mother was frantically trying to free her baby by pulling its legs, but this only caused the baby to scream in distress. Eventually the mother was shot with a tranquiliser gun until the baby could be freed, but the whole thing made a huge impression on me. 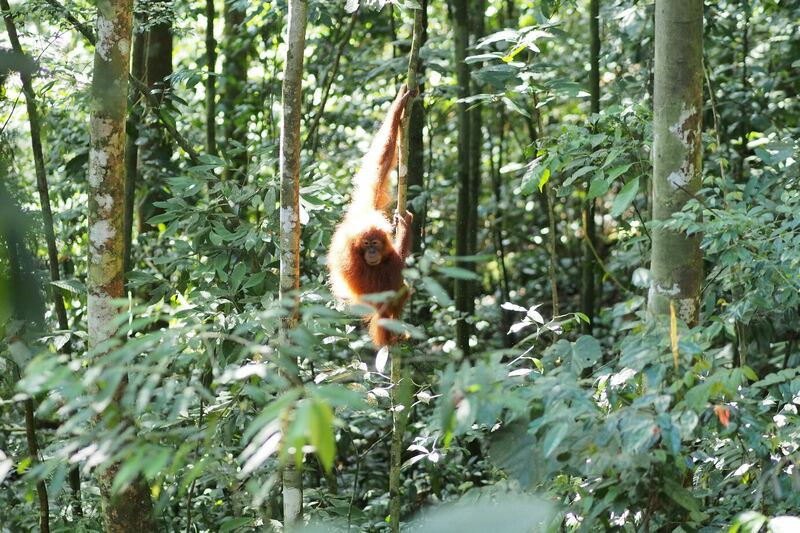 I wanted orangutans to be free and I wanted to see them in the wild. In 1973 two Swiss zoologists, Regina Frey and Monica Boerner, came to Indonesia to rescue orangutans that people had kept as domestic pets. A law was passed banning this kind of activity, but what of the animals already raised in captivity? 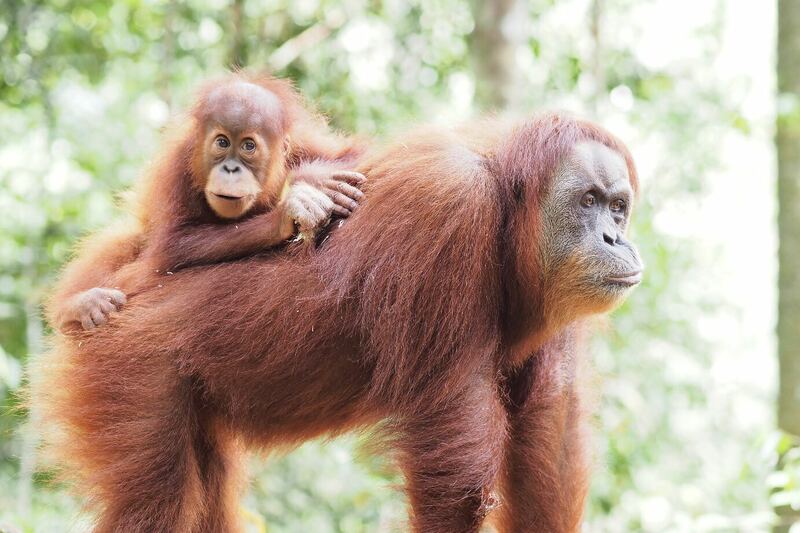 Regina and Monica opened up a rehabilitation centre where the animals stayed before releasing them back into the jungle – the jungle of Bukit Lawang. Fast forward however many years, and we were here to see these awesome beasts in their home territory…and definitely on their terms. 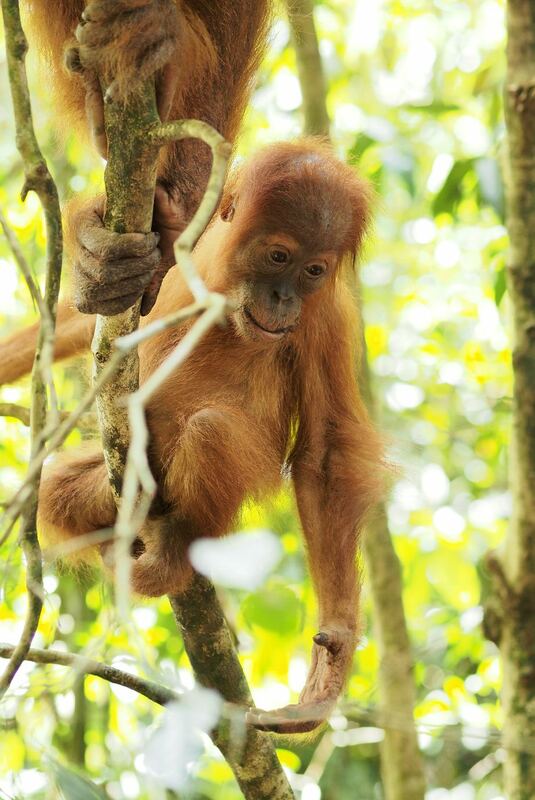 With a reputation that preceeded her, Mina, the oldest of the semi-wild orangutans, was one to watch out for. Many a guide carried the mark of her teeth on their bodies through one altercation or another. The story goes that one of her babies disappeared in the wild and since then she has been very aggressive towards humans. Face of a mafiosa, when we saw it, there was no mistaking it was her. She had positioned herself in the middle of a small clearing. Some tourists had passed by her and were on the far side. We were approaching on the other. I could see how uneasy she was about being surrounded, but there was no doubt about who would come out on top if it came down to it. As we tried to creep past, she started to come towards us. The guides were taking no chances; they pulled out some bananas, which they passed to her from as far away as physically possible, as we slipped away. After a slow but arduous climb and equally steep decent, we reached camp. Here we were met by Rahim, our jungle chef. Hungry and tired, we wolfed down the amazing selection of food cooked for us. How on earth did he manage to get all the supplies here to the middle of the jungle, we wondered. “Short cut.” Looking at the phone’s GPS, we could see we were suprisingly near where we started our trek. Seems we had been taking the scenic route, but we certainly weren’t in the middle of the jungle. We hung out our stinky wet clothes and tucked ourselves into bed, drifting off to the sounds of nature. The next morning we were unsurprised to find that our clothes were still soaking wet and just as smelly as we remembered. Reminding ourselves we would be just as wet within about 10 minutes of hiking, we forced ourselves into the same clothes as the previous day and set off on what seemed to be an even steeper path through the jungle. 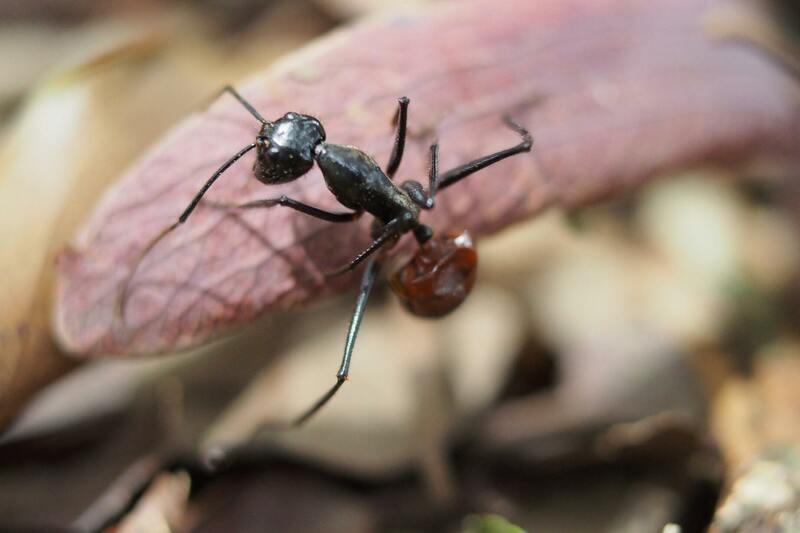 We were nearing our camp for the second night, resigned to the fact that we would not see any animals that day (bar the ants), when we saw a flash of orange up ahead. I checked to make sure Nick hadn’t gone ahead. No, it wasn’t his beard; it was pure orangutan and it was headed our way. 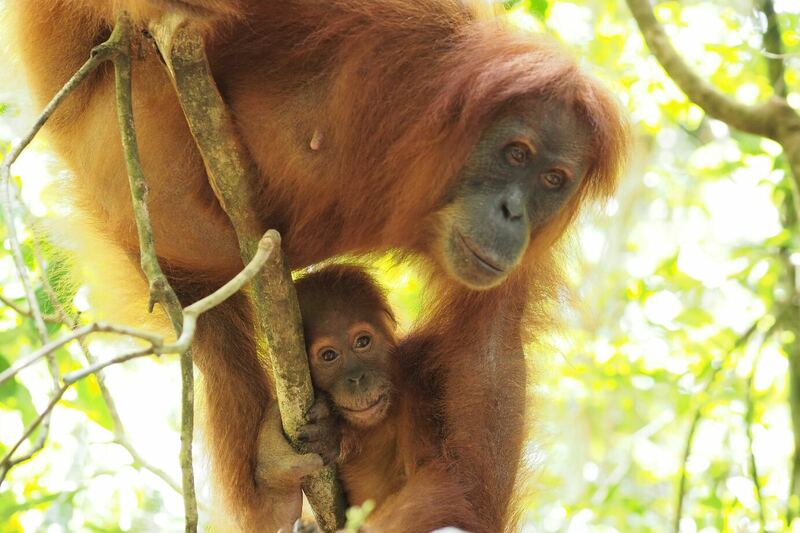 In fact, as the orange got closer, we saw there were three of them – the mother was Jackie and she was accompanied by one large baby and one tiny one. This was the moment we had been waiting for all day, but the guides seemed intent on moving along quickly. Hang on a minute, we thought. We hadn’t seen any animals all day, and here we were being rushed away from these three. Jackie landed and Heri, one of our guides, went to distract her so we could pass. Reluctantly, we kept moving, but the Canadian couple hung back to take a photo just a few seconds longer. Before we knew it, Jackie was on the path with me and Nick ahead, the Canadian couple behind. As Mylan tried to walk past, Jackie’s hand was already firmly around her wrist. Ha. So, what to do now? Jackie wasn’t aggressive, but she knew what she was doing, and that certainly didn’t involve letting go. As we continued along the most difficult part of the path yet, Mylan was led by Jackie, who at times, politely signalled her to go first. 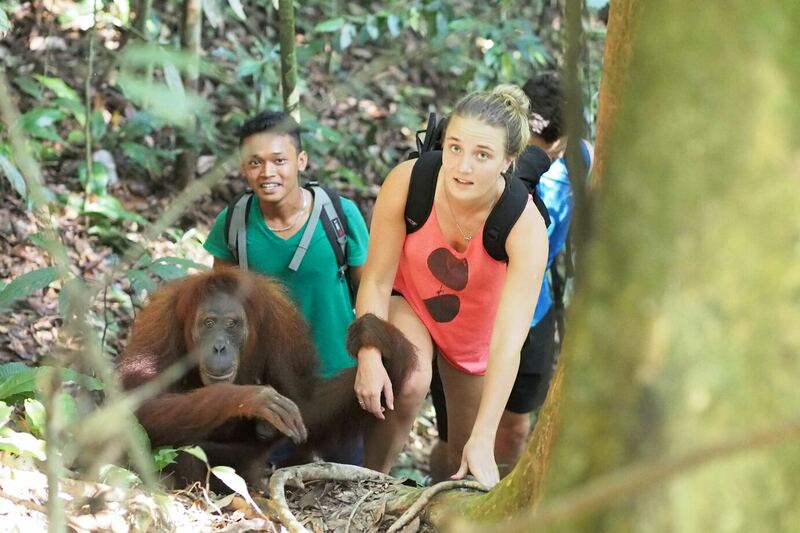 Unable to free Jackie’s firm grip, she did as she was told, although trying to keep at an orangutan’s pace through the jungle was no mean feat. Hurried along the path, we reached a flat bit of land and Nick, Mylan’s boyfriend and I were instructed to carry on the path out of sight. Selfish as we both knew it was, we admitted how much we would have liked to be the one being latched onto by Jackie. However, the reality is, this kind of contact passes bacteria between the two and can be very harmful for both human and animal. Finally Mylan caught up with us, Heri the guide still out of sight. As Heri had passed her some sugar cane, he had managed to distract her enough to prise Mylan’s arm free and tell her to leg it (probably followed by “take your time – you’re on holiday”). Jackie had got what she wanted all along. Mylan was her hostage and sugar cane her ransom. If I didn’t know better, I’d have said that it was not Kurt Cobain, rather our other guide Heri that had written this. The next morning Nick and I opted for a couple of hours trek before meeting the other guys, obviously out-jungled, at a waterfall. “We’ll have to leave at 8am,” Heri decided. By 7.55am we had shoes on and were raring to go. No sign of Heri. At 9am I found he had returned and was, surprise surprise, smoking a fag in the kitchen. 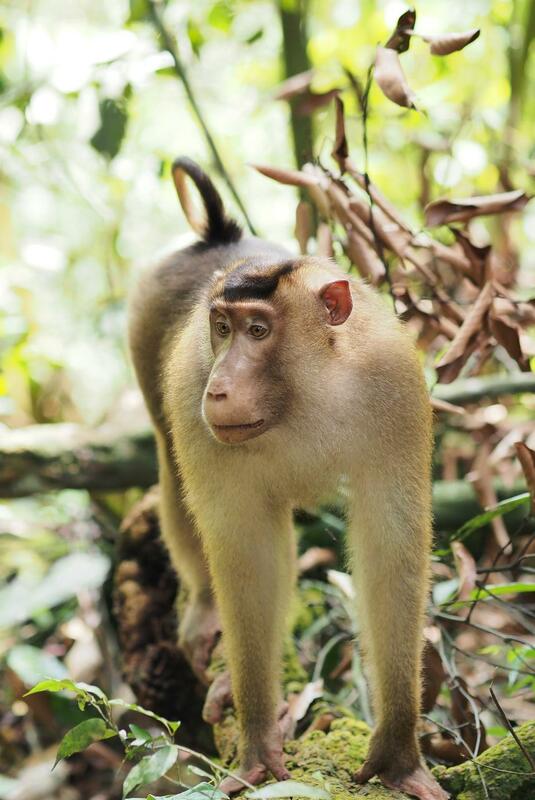 We hadn’t been walking long when we came across a big group of long tail macaques. Good news. This was why we were hiking after all – to experience the animals in their natural habitat. Naturally we stopped to take pictures. Nick had no sooner got his camera out than Heri was rushing us on. Fags were obviously higher up the food chain than monkeys. We made the decision there and then to skip the trek and instead opted to stay and watch the monkeys, Heri’s incessant chatter about relaxing bubbling away in the background. We watched them for a good half an hour, the dynamics of each group giving new interest: two tiny babies wrestling in the trees, tumbling down and crashing into a preening session, whilst close by the alpha male did his best for procreaction, although his best was a few seconds at most. Even when we got back to camp, the fun was not yet over. 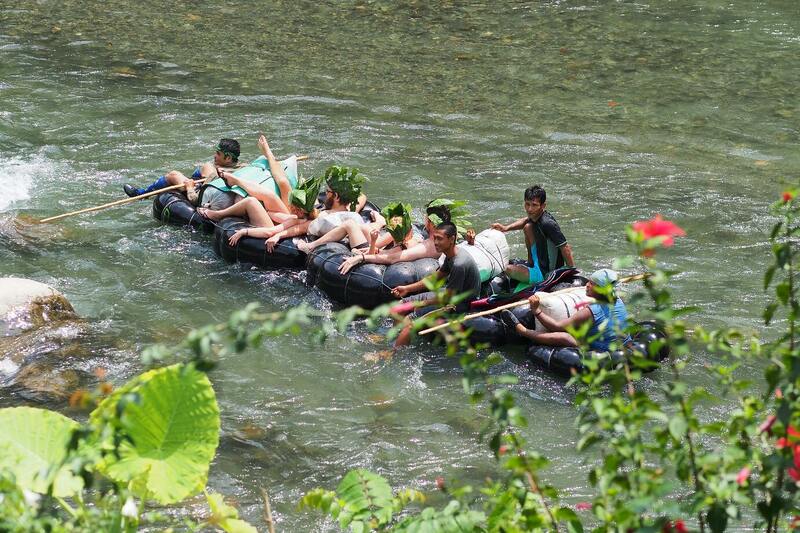 We had one important part of the journey left – rafting on the river to get back! It was a fitting end to an unforgettable three days.